Contains the records of the University of Southern Maine as well as its precursors, Gorham Normal School through the University of Maine in Gorham (1878-1970), Portland University (1921-1961), Portland Junior College (1933-1957), and the University of Maine in Portland (1957-1970); University of Maine, Portland - Gorham (1970-1978). 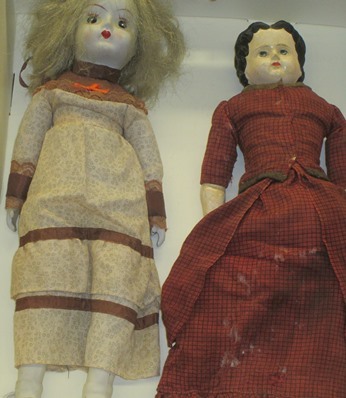 Can you provide the USM Archives with information about these dolls? If yes, please contact Susie Bock, susie.bock@maine.edu. Left: cloth dolls with china heads, arms, and legs found in the Alumni House (Portland Campus).